The Vectorize Buildings tool located within TerraScan is used to generate 3D building models based upon the loaded LIDAR data. The tool will generate MicroStation cell elements, which contain shapes for each roof plane, possibly roof sides, which determine the roof’s thickness and wall shapes for each outer roof edge. User roof class is how one would keep small details, such as a chimney in the vector model. A user would classify the feature into the user roof class and then even if it is smaller than the minimum detail then it will still be vectorized into the model. This is one way to create very detailed models, but would be very time consuming. All points – all loaded points are processed. This may include points from neighbour blocks. Active block – points of the active block are processed. Inside fence – points inside a fence or selected polygon are processed. This is only active if a MicroStation fence is drawn or a polygon is selected. Do not use – no polygons are used. As bounding polygons – polygons define boundaries that divide large building blocks into separate models. Example: land property polygons. As roof edges – polygons define the XY shape of outer edges of buildings. Examle: footprint polygons. Design file level on which the polygons are located that are used in the vectorization process. This is only active if Use polygons is set to As bounding polygons or As roof edges. Maximum distance between building parts belonging to the same model. If the distance is larger, separate building models are created. Defines how closely a point must match a plane equation to belong to that roof plane. Additional tolerance for merging close to horizontal planes together. Minimum size of a building footprint. Minimum size of a building part footprint. Maximum gradient of a roof plane. If on, building edges are adjusted based on images. The images must be referenced by an image list loaded into TerraPhoto. If on, wall shapes are colored randomly by using a selection of colors from the active color table of MicroStation. 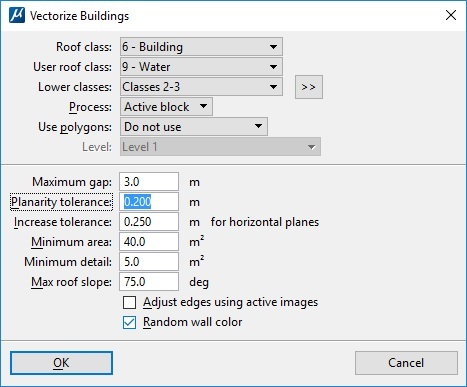 If off, the color defined in Building vectorization / Model category of TerraScan Settings is used for all wall shapes.